Jason Thomas Mraz (/məˈræz/; born June 23, 1977) is an American singer-songwriter who first came to prominence in the San Diego coffee shop scene in 2000. In 2002 he released his debut studio album, Waiting for My Rocket to Come, which contained the hit single "The Remedy (I Won't Worry)". With the release of his second album, Mr. A-Z, in 2005, Mraz achieved major commercial success. The album peaked at number 5 on the Billboard 200 and sold over 100,000 copies in the US. In 2008 Mraz released his third studio album, We Sing. We Dance. We Steal Things. It debuted at number 3 on the Billboard 200 and was an international commercial success primarily due to the hit "I'm Yours". The song peaked at number 6 on the Billboard Hot 100, giving him his first top ten single, and spent a then-record 76 weeks on the Hot 100. His fourth album, Love Is a Four Letter Word, peaked at number 2 on the Billboard 200, his highest-charting album to date. Mraz has won two Grammy Awards and received two additional nominations, and has also won two Teen Choice Awards, a People's Choice Award and the Hal David Songwriters Hall of Fame Award. He has earned Platinum and multi-Platinum certifications in over 20 countries, and has toured in North America, South America, Europe, Asia, Australia, the Middle East and parts of Africa. As of July 2014 Mraz has sold over seven million albums, and over 11.5 million downloaded singles. His musical style, from rhythmic feeling to his use of nylon string guitars, has been heavily influenced by Brazilian music. Mraz was born and raised in Mechanicsville, Virginia. He is of Czech and Slovak descent through his grandfather, who moved to the United States from Austria-Hungary in 1915. His surname is Czech for "frost". (Czech: mráz) His parents, Tom (Tomáš) Mraz and June Tomes, divorced when he was five years old. His father is a postal worker, and his mother is vice president at a branch of Bank of America. Mraz has said he had an idyllic childhood: "My hometown of Mechanicsville was very American. There were white picket fences, a church on every street corner, low crime and virtually no drug use. It was a good place to grow up." While attending Lee-Davis High School, Mraz was a member of the cheerleading squad, school chorus, and drama club. He starred as Joseph in Joseph and the Amazing Technicolor Dreamcoat and as Snoopy in a play about the Peanuts characters. Mraz graduated in 1995. After high school, Mraz attended the American Musical and Dramatic Academy in New York City for about a year and a half, originally to work in musical theater. In New York, a friend gave him a guitar that was about to be thrown away, and Mraz learned to play guitar. Guitar allowed him to play music unaccompanied and write his own music. Mraz moved to the Shockoe Bottom neighborhood of Richmond, Virginia, where he took a series of odd jobs, including elementary-school janitor, and joined the Ashland Stage Company. Mraz then enrolled at Longwood University in Farmville, Virginia, on a scholarship. Instead of attending classes, he headed west on a road trip that ultimately brought him to San Diego, where he decided to stay. Soon after moving to San Diego in 1999, Mraz became a roadie for the band Elgin Park. He met future band member Toca Rivera at the coffee house Java Joe's in the Ocean Beach neighborhood of San Diego, where he performed once a week for nearly three years, building a following in San Diego and online. In 2001, Mraz released the live acoustic album Live at Java Joe's, performing with percussionist Rivera and bassist Ian Sheridan. The album featured Mraz's freelancing vocal style and several songs he would later re-release, including "1000 Things", "You and I Both" and "Halfway Home." The album was made available to download on iTunes on March 11, 2008, under the title Jason Mraz: Live & Acoustic 2001. In late 2001, Mraz signed a recording contract with Elektra Records and moved to Los Angeles. In 2002, he opened for Jewel on her tour. On October 15, 2002, Mraz released his first major label debut album, Waiting for My Rocket to Come, which peaked at number 55 on the Billboard 200. The lead single, "The Remedy (I Won't Worry)", was co-written by music production team The Matrix, and became Mraz's first top 10 single on the Billboard Hot 100, peaking at number 3, becoming one of the biggest songs of 2003. The song was inspired by a high school friend who was diagnosed with cancer. At the time of the album's release, Mraz said that he did not like "The Remedy (I Won't Worry)" and had not wanted it on the album because it had started as a special and experimental song and the record label had "chalked up this chorus". The day after the album's release, Mraz played on "The Late Late Show With Craig Kilborn". On May 19, 2005, Waiting for My Rocket to Come was certified Platinum, for selling 1 million units. Mraz opened for Tracy Chapman in 2003 at the Royal Albert Hall in London. In 2004, while on tour, Mraz released a live album with an accompanying DVD, Tonight, Not Again: Jason Mraz Live at the Eagles Ballroom. He performed with his touring band, including drummer Adam King, Rivera, Sheridan and keyboardist Eric Hinojosa, along with a guest appearance from Blues Traveler frontman John Popper. On July 26, 2005, Mraz released his second major label album, Mr. A–Z, produced by Steve Lillywhite for Atlantic Records. The album's lead single, "Wordplay", was produced by Kevin Kadish, and entered the Billboard 200 at number 5. The album earned a Grammy Award nomination for Best Engineered Album, Non-Classical, while Lillywhite received a nomination for Producer of the Year. 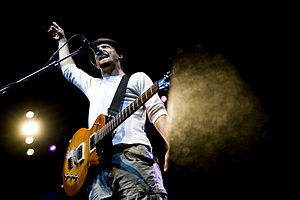 Mraz began a long-running tour in support of Mr. A–Z at the San Diego Music Awards on September 12, 2005. The tour featured several opening acts, including Bushwalla and Tristan Prettyman, with whom he had written the duet "Shy That Way" in 2002. Mraz opened for Alanis Morissette during her 2005 Jagged Little Pill Acoustic tour, and for the Rolling Stones on five dates during their 2005–06 world tour. In March 2006, he performed in Singapore as part of the annual Mosaic Music Festival. That May, he toured mostly small venues and music festivals in the U.S., along with a few shows in the United Kingdom and Ireland where he supported James Blunt  The tour included a May 6, 2006 acoustic show with P.O.D., Better Than Ezra, Live, and The Presidents of the United States of America. Mraz was featured as a headlining guest of St. Louis's annual Fair St. Louis and performed a free concert at the base of the Gateway Arch on July 1, 2006. During this time, Mraz was also the opening act at several dates for Rob Thomas' Something to Be Tour. Jason Mraz performs at Foxwoods Resort Casino in Ledyard, Connecticut on May 17, 2006. On May 13, 2008, Mraz released his third studio album, We Sing. We Dance. We Steal Things. The album debuted at number 3 on the Billboard 200. It broke into the top 10 of many international music charts, and reached number 3 in the US and Australia. In March 2009, it was certified Platinum for selling 1 million units. Mraz has said that the album title was taken from the work of Scottish artist David Shrigley. Prior to its release, Mraz released three EPs, each with acoustic versions of songs from the album. The lead single, "I'm Yours", was written in August 2004 and originally released as a free acoustic B-side when Mr. A-Z came out. Through Mraz's live performances of the song, it gained in popularity with fans. When he played it at a festival in Sweden in 2007, the fans were ecstatic and singing along, after which Mraz realized the song's popularity and decided to make it the centerpiece of his next album. "I'm Yours" became Mraz's first Top 10 hit on the Billboard Hot 100, peaking at #6 on September 20, 2008. It ultimately spent 76 weeks on the Hot 100, longer than any other song in the magazine's 51-year history (a record since broken by Imagine Dragons with "Radioactive" in 2014). It was a major commercial success in the US, receiving a 7x multi-Platinum certification from the RIAA for digital sales of over seven million. The song was also successful internationally, topping the charts in New Zealand, Norway, Portugal and Sweden, and peaking in the top ten on the charts in 11 other countries. By May 2012, it had gained over 125,000,000 hits on YouTube. It was the first song to top the charts in four different radio formats: Mainstream Top 40, Adult Contemporary, Adult Top 40 and Triple A. It also made the Latin Pop and Smooth Jazz charts. Mraz won his first two Grammy Awards in 2010, for Best Male Pop Vocal Performance ("Make It Mine") and Best Pop Collaboration ("Lucky" with Colbie Caillat). At the 2009 Grammy Awards, "I'm Yours" was nominated for Song of the Year and Best Male Pop Vocal Performance, and We Sing. We Dance. We Steal Things. was nominated for Best Engineered Album, Non-Classical. [unreliable source?] "I'm Yours" was also named ASCAP's 2010 Song of the Year. Mraz's 2008 world tour took him all over the United States, Europe, Asia and Australia. His personal photo travelogue from the world tour was published as a book, titled A Thousand Things (2008). The book contains Polaroids from his time touring and backpacking around Europe, and was launched with a photo exhibition at Charles Cowles Gallery in New York City at the end of 2008. Also in 2008, Mraz played with Eric Clapton to a crowd of 45,000 in Hyde Park, London, sold out London's Royal Albert Hall and performed at the Nobel Peace Prize Concert in Oslo. That year also marked his Music, Magic & Make Peace Tour with Bushwalla, The Makepeace Brothers, and magician Justin Willman. Mraz brought along the magician after picking up magic as a hobby during recording sessions for We Sing. We Dance. We Steal Things. On January 31, 2009, Mraz was the musical guest on Saturday Night Live, performing "I'm Yours" and "Lucky",[unreliable source?] which peaked on the Hot 100 at number 82. In 2009, Mraz was awarded the Hal David Starlight Award from the Songwriters Hall of Fame. In 2009, while preparing for his new album, Mraz recorded "The Way Is Love", an unreleased Roy Orbison song, as a duet with Willie Nelson. In November 2009, he released the live CD/DVD Jason Mraz's Beautiful Mess: Live on Earth, recorded in Chicago during the Gratitude Café tour. The following year, he went to Brazil to record "Simplesmente Todo" with Milton Nascimento, who sings in Portuguese while Mraz sings in English. He also did some writing with Dido, and recorded new material with producer Martin Terefe. Mraz then released two live EPs: the Life Is Good EP on October 5, 2010, and the Live Is A Four Letter Word EP on February 28, 2012. Love Is a Four Letter Word was released on April 13, 2012. It reached number 2 on the Billboard 200, and the top 20 in 10 other countries. The lead single, "I Won't Give Up", debuted at number 8 on the Billboard Hot 100, and number 1 on the Digital Songs chart. It charted in 15 countries in total, and in October 2013 was certified 4x multi-platinum, for selling in excess of 4 million units. Mraz premiered the track live during his 2011 tour, before an official version had been released. It began to receive a lot of attention through live performances, as well as online. The official lyric video gained over 2.5 million views in its first 10 days on YouTube. Love Is a Four Letter Word was nominated for a 2012 Grammy Award for Best Engineered Album, Non-Classical. Mraz won a 2013 People's Choice Award for Favorite Male Artist. He performed at Farm Aid 2011 in Kansas City. In 2012 he played sold-out shows at the Hollywood Bowl in Los Angeles, Madison Square Garden in New York and the O2 Arena in London, and performed at President Barack Obama and family's lighting of the national Christmas tree at the White House; a noted Obama supporter, he has also performed at numerous other events involving Obama and Vice President Joe Biden. Also in 2012, he performed "You Did It" at the presentation ceremony for the Kennedy Center's Mark Twain Prize for American Humor, won that year by Ellen DeGeneres. Mraz's fifth studio album, Yes!, was released on July 15, 2014. It is his first acoustic album, and was recorded with all-female folk rock band Raining Jane. They had previously co-written "A Beautiful Mess" for Mraz's 2008 album We Sing. We Dance. We Steal Things. Aside from a cover of the Boyz II Men song "It's So Hard to Say Goodbye to Yesterday", every song on Yes! was written by Mraz and Raining Jane. The lead single, "Love Someone", was released on May 19, 2014, with Mraz performing an acoustic version of the song for Time. On June 20, 2014, he released We Can Take the Long Way, a music video trilogy for the first three songs on Yes! – "Love Someone", "Hello, You Beautiful Thing" and "Long Drive". It premiered on the USA Today website. On September 27, 2017, it was announced that Mraz would make his Broadway debut in the musical Waitress. He took on the role of Dr. Pomatter on November 3, 2017 for a 10-week run. Sara Bareilles re-joined the cast during his run and he extended his time as Dr. Pomatter playing his final show on February 11, 2018. He had previously sung "Bad Idea" and "You Matter to Me" on Sara Bareilles' 2015 album (based on the show's music) What's Inside: Songs From Waitress. Prior to and following his involvement in Waitress, Mraz began work on a follow-up album to Yes! In June 2018, he announced that his sixth studio album, Know.—a play on the previous album's title—will be released on August 10, 2018. He referred to the new album as "bright and shiny" and a "classic-sounding pop acoustic, vocally driven record with positive lyrics and love songs." Mraz was engaged to singer-songwriter and long-time close friend Tristan Prettyman on Christmas Eve 2010; they broke off the engagement six months later. Mraz lives a health-conscious lifestyle and has said that he eats mostly raw vegan foods. His vegan diet has also influenced his music. He owns a five-and-a-half acre avocado farm in Oceanside, California. He is an investor at Café Gratitude, a vegan restaurant in Los Angeles, and named his 2011 tour Gratitude Café in its honor. His hobbies include surfing, yoga and photography. On October 25, 2015, Mraz married his girlfriend, Christina Carano, in a private ceremony in his hometown of Mechanicsville, Virginia. In June 2018, Mraz penned a "love letter" to the LGBT community, as part of a Billboard feature during Gay pride month. A line in the poem had led some media reports to state that the poem may represent Mraz's coming out as bisexual. In an article published on July 19, 2018 by Billboard, Mraz said he has had previous experiences with men, even while dating Carano. Mraz said Carano defined him as a "two-spirit", a description that was criticized by some as misappropriating a word originally designed solely for the native population, and for distorting the term's meaning. In August 2018, Mraz confirmed in an interview with the New York Post that he now identifies as bisexual. Mraz is a social activist whose philanthropic efforts span wide-ranging issues, including the environment, human rights and LGBT equality. In 2009, he participated in a rescue mission to Ghana with members of Free the Slaves, a global nonprofit working to liberate children sold into slavery. In 2012, he was featured as the first-ever straight man on the cover of Instinct magazine in recognition of his efforts in support of LGBT rights. The Jason Mraz Foundation was established in 2011, with a mission to support charities in the areas of human equality, environment preservation and education. Organizations supported by the foundation include VH1's Save The Music Foundation, MusiCares, Surfrider Foundation, Free the Children, Life Rolls On, the School of the Performing Arts in the Richmond Community, the Natural Resources Defense Council, and the True Colors Fund, which promotes LGBT equality. Mraz was named the 2010 Surf Industry Manufacturers Association (SIMA) Humanitarian of the Year. He also received the Clean Water Award in 2010 from the Surfrider Foundation, for helping to preserve the world's oceans and beaches. That same year, he teamed up with The Nature Conservancy and created a PSA using his song "I'm Yours" to raise awareness about the nonprofit organization's efforts to protect the earth. On December 16, 2012, Mraz headlined the Milestone Concert in Myanmar to raise awareness about human trafficking, making him the first foreign artist to play an open-air concert in Myanmar. The concert was organized by MTV EXIT and held in the People's Square in Yangon, with over 70,000 people in attendance, as part of an initiative to raise awareness about human trafficking in Myanmar. Also in 2012, Mraz spent a week in Antarctica with a group of environmentalists, scientists and researchers on a mission led by Al Gore, to learn about the effects of climate change. ^ "Jason Mraz: My music says 'Everything will be OK'," CBS News, July 13, 2014. ^ "Top Artists (Digital Singles)," RIAA. Accessed July 15, 2014. ^ Rodgers, Jeffrey Pepper. "JASON MRAZ." Acoustic Guitar 10 2010: 48–53. ^ "Upbeat: Jason Mraz Believes in Magic." International Musician 10 2006: 25. ^ a b c Keith Bellows, "Traveling Troubadour," National Geographic Traveler, March 2011. ^ a b c d e f g h Blair, Tom (November 2008). "Dialogue: Jason Mraz". San Diego Magazine. Retrieved February 6, 2009. ^ Ruggieri, Melissa (October 5, 2003). "All That Mraz: After Breaking Big, Musician Comes Home to His Family, and Maybe Brunswick Stew". Richmond Times-Dispatch (Richmond, Virginia). p. H1. ^ a b c Thrills, Adrian (December 25, 2008). "With fans like the Rolling Stones, singer Jason Mraz won't remain a virtual unknown in the UK for long". Daily Mail. Retrieved December 27, 2010. ^ Patterson, Kristin (July 26, 1992). "Finding Right Joseph Was Battle Against Odds". Richmond Times-Dispatch. p. N3. ^ Johnson, Ophelia (July 29, 1992). "Adding a Sparc of Color to Dogwood Dell Program". Richmond Times-Dispatch. p. C1. ^ Andersen, Laurie (March 10, 1993). "Theme Sets Tone for Karaoke Parties: Lee-Davis Students to Present 'Snoopy!'". Richmond Times-Dispatch. p. H2. ^ "780 Seniors Earn Diplomas". Richmond Times-Dispatch. June 14, 1995. p. J8. ^ a b c d Ruggieri, Melissa (November 27, 2002). "Jason Mraz Home, and Just Look at Him Now". Richmond Times-Dispatch (Richmond, Virginia). p. E1. ^ Yadegaran, Jessica (May 16, 2003). "In the Mood for Mraz: Jason Mraz Opened for Jewel's Local Performance Last Year This Time, He's the Star of the Show". The Tribune (San Luis Obispo, California). p. 14. ^ White, Sue (October 23, 2003). "Experience builds music career". Saginaw News (Saginaw, Michigan). p. 3D. ^ Deeds, Michael (January 17, 2003). "Singer Mraz ditches mop, waits for his 'Rocket to Come'". The Idaho Statesman (Boise, Idaho). p. 3. ^ a b c d e f g Joan Tupponce, "Jason Mraz," Richmond Magazine, March 24, 2010. ^ Proctor, Roy (November 30, 1998). "'Celebration' A Revelation". Richmond Times-Dispatch. p. E5. ^ Garin, Nina (December 6, 2001). "Like other local greats, Jason Mraz hopes to find his cup runneth over with success". The San Diego Union-Tribune. ^ Garin, Nina (January 3, 2002). "Just one more list: Local music scene has its top sounds too". the San Diego Union-Tribune. ^ Bass, Debra D. (September 15, 2002). "Jewel Tour Shows What's Under the Label". The Press Democrat (Santa Rosa, California). p. Q17. ^ "’NOW 19’ Still No. 1 On Album Chart," Billboard. Retrieved May 25, 2014. ^ a b Jason Mraz: Chart History, The Hot 100, Billboard. Retrieved May 25, 2014. ^ Garin, Nina (October 10, 2002). "Coffee Break: With all those Java Joe's gigs under his belt, Jason Mraz tests the recording waters". The San Diego Union-Tribune. ^ McDonough, Kevin (October 16, 2002). "Practice, practice, practice for Carnegie opening". Chattanooga Times Free Press (Chattanooga, Tennessee). p. 46. ^ a b c d Searchable Database (search under: Jason Mraz), RIAA. Accessed July 15, 2014. ^ Paul Woloszyn, "Interview – Jason Mraz," musicOMH, August 3, 2005. ^ Ansell Regalado, "Tonight’s A Treat For Mraz’s Fans," Sun-Sentinel, December 24, 2004. ^ a b "Mraz Nails Down New Album, Alanis Dates," Billboard. Retrieved May 25, 2014. ^ a b Keith Caulfield, "Jason Mraz Vs. Lionel Richie For No. 1 Album Next Week," Billboard, April 19, 2012. ^ "Fast Facts: 48th Annual Grammy Nominees". Fox News. December 8, 2005. Archived from the original on May 30, 2007. Retrieved July 1, 2007. ^ Jacobs, Jay S (2005). "Tristan Prettyman Rides the Crest". Archived from the original on July 3, 2007. Retrieved July 1, 2007. ^ "GAP Favorites Alanis Morissete, Jos Stone, Destiny's Child sing Michelle Williams and Keith Urban". July 31, 2005. Archived from the original on November 24, 2005. ^ Kari Livingston, "The Case for American Idol’s Dark Horse, Chris Richardson," Yahoo! Voices, April 12, 2007. ^ "Charts–''We Sing. We Dance. We Steal Things.''". Acharts.us. Retrieved August 19, 2012. ^ "An EP Extravaganza," Billboard. Retrieved May 25, 2014. ^ Silvio Pietroluongo, "Black Eyed Peas, Jason Mraz Streak To Hot 100 Records," Billboard, August 19, 2009. ^ "Jason Mraz: A Breakup Record, Served With A Smile," NPR, May 6, 2012. ^ Daniel Kreps, "Black Eyed Peas, Jason Mraz Make Hot 100 History," Rolling Stone, August 19, 2009. ^ Gary Trust, "Imagine Dragons’ ‘Radioactive’ Breaks Record for Longest Hot 100 Run," Billboard, February 19, 2014. ^ "Charts – "I'm Yours"". Acharts.us. August 12, 2008. Retrieved August 19, 2012. ^ "Jason Mraz: ‘It took me 20 minutes to write record-breaking track I’m Yours’," Metro, May 10, 2012. ^ Leah Greenblatt, "Jason Mraz's 'I'm Yours' smashes Billboard record, remains totally unkillable," Entertainment Weekly, August 20, 2009. ^ "Grammy Awards: List of Winners," New York Times, January 31, 2010. ^ "Grammy Awards: List of Winners," New York Times, February 8, 2009. ^ a b Saul Relative, "Jason Mraz, Colbie Caillat and Steve Martin on SNL," Yahoo! Voices, February 2, 2009. ^ "ASCAP Foundation Honors Jason Mraz with Champion Award," ASCAP, December 10, 2012. ^ "Nobel's Night Out," CBS News, December 11, 2008. ^ "Exclusive Interview: Magic Influences Jason Mraz’s Music," MTV Buzzworthy, May 13, 2008. ^ "Jason Mraz to get Hal David Starlight Award". Songhall.org. April 14, 2009. Retrieved August 19, 2012. ^ Graff, Gary (September 14, 2009). "Jason Mraz May Turn 'Tons of Material' Into Two New Albums". Billboard. Retrieved January 28, 2011. ^ Jason Mraz Chart History, Billboard 200, Billboard. Retrieved May 25, 2014. ^ Jason Mraz – Love Is A Four Letter Word, acharts.us. Retrieved May 25, 2014. ^ a b Gary Trust, "Jason Mraz’s ‘I Won’t Give Up’ Storms Hot 100s Top 10," Billboard, January 11, 2012. ^ Jason Mraz – I Won’t Give Up, acharts.us. Retrieved May 25, 2014. ^ Marc Schneider, "People’s Choice 2013: Katy Perry and One Direction Feel the Love," Billboard, January 10, 2013. ^ "Farm Aid Adds More Artists to Acclaimed 2011 Concert Lineup," farmaid.org, July 7, 2011. ^ Steven Mirkin, "Live review: Jason Mraz proves bland at the Bowl," Orange County Register, October 6, 2012. ^ Araceli Cruz, "Jason Mraz Live at Madison Square Garden: By the Numbers," Fuse, December 11, 2012. ^ Natt Day, "Jason Mraz at The O2 Arena, London," The Edge, December 10, 2012. ^ Matt Compton, "Watch the Lighting of the National Christmas Tree," whitehouse.gov, December 6, 2012. ^ Eric Sandy, "Joe Biden will speak at Lakewood High Sunday, Jason Mraz will perform," Cleveland.com, November 2, 2012. ^ Patrick Gavin, "More Stars Added to Obama Rally," Politico, April 20, 2011. ^ PBS "Jason Mraz Performance"
^ a b Lily Rothman, "Jason Mraz Announces New Album, With An Exclusive Acoustic Performance," Time, May 19, 2014. ^ Elysa Gardner, "You just can't say no to Jason Mraz's optimism," USA Today, July 14, 2014. ^ Jason Lipshutz, "Jason Mraz Shouts ‘Yes!’ on July Album: Hear The First Single," Billboard, May 19, 2014. ^ "Jason Mraz, Raining Jane in concert at Performing Arts Center," Santa Maria Times, March 14, 2014. ^ Sandy Cohen, "Music Review: Jason Mraz's 'YES!' a bright acoustic romp enriched by new backing band," Star Tribune, July 14, 2014. ^ Korina Lopez, "'Yes!' Jason Mraz reveals 3 new songs in 1 video," USA Today, June 20, 2014. ^ "Jason Mraz Extends Broadway Waitress Stint Opposite Sara Bareilles | Playbill". Playbill. Retrieved February 12, 2018. ^ a b c d "Jason Mraz announces "bright and shiny" new album "Know." due Aug. 10, one-night-only movie on Aug. 7". ABC News Radio. June 14, 2018. Retrieved August 9, 2018. ^ Weatherby, Taylor (April 27, 2018). "Jason Mraz Turns a Buddhist Monk's Blessing Into a Feel-Good Tune With 'Have It All'". Billboard. Retrieved April 27, 2018. ^ Wass, Mike (April 27, 2018). "Jason Mraz Returns With The Uplifting & Anthemic "Have It All"". Idolator. Retrieved April 27, 2018. ^ Nelson, Jeff (July 26, 2018). "Jason Mraz and Meghan Trainor Release New Duet 'More Than Friends'". People. Retrieved July 28, 2018. ^ "Jason Mraz Splits With Fiancee Tristan Prettyman," US Weekly, June 8, 2011. ^ "'Interview – Jason Mraz" Archived March 1, 2016, at the Wayback Machine audiophil.tv, June 23, 2014. ^ "Jason Mraz (2)". Vegetarianstar.com. Retrieved August 19, 2012. ^ Tracey Pepper, "One-On-One With Jason Mraz," Vegetarian Times. Retrieved May 25, 2014. ^ Deborah Schoeneman, "Power Lunch With a Side of Homilies," New York Times, July 20, 2011. ^ "Jason Mraz Gets Married in an Incredible Open Air Church | TheVine". TheVine.com.au. Archived from the original on October 27, 2015. Retrieved October 26, 2015. ^ Mraz, Jason (June 14, 2018). "Jason Mraz: Love Letter to the LGBTQ Community". Billboard.com. Retrieved June 20, 2018. ^ "Jason Mraz Might Have Just Come Out, Poetically". Towleroad. June 19, 2018. Retrieved June 20, 2018. ^ Morgan, Joe (June 19, 2018). "Did Jason Mraz just come out as bisexual in this touching poem?". Gay Star News. Retrieved June 20, 2018. ^ Manzella, Samantha (June 19, 2018). "Did Jason Mraz Just Come Out?". NewNowNext. Retrieved June 20, 2018. ^ a b Reilly, Phoebe (July 19, 2018). "Jason Mraz Talks Trump Inspiring 'Rebellion Songs' & Embracing His Sexuality". Billboard.com. Retrieved July 27, 2018. ^ Donnelly, Matthew Scott (July 24, 2018). "Jason Mraz Slammed for 'Two Spirit' Bisexuality Explanation". PopCrush. Retrieved July 27, 2018. ^ Arnold, Chuck (August 2, 2018). "Jason Mraz: My bisexuality was 'a very stressful secret'". New York Post. Retrieved September 13, 2018. ^ Jeff Katz, "Cover Guy: Jason Mraz," Instinct, April 2012. ^ a b "Jason Mraz Establishes Jason Mraz Foundation," Artist Direct, December 5, 2011. ^ Celebrity Ambassadors Archived April 17, 2014, at the Wayback Machine, VH1 Save the Music Foundation. Retrieved May 25, 2014. ^ "SPARC alum Jason Mraz performs benefit concert as grand finale of SPARC's 30th Anniversary". sparconline.org. December 8, 2012. Archived from the original on April 24, 2012. Retrieved December 8, 2012. ^ "Jason Mraz Named 2010 SIMA Humanitarian Of The Year," Vegetarian Star, August 18, 2010. ^ "Clean Water Awards Announced!" Archived May 27, 2014, at the Wayback Machine sandiego.surfrider.org. Retrieved May 25, 2014. ^ "Jason Mraz PSA for The Nature Conservancy," Archived May 27, 2014, at the Wayback Machine The Nature Conservancy. Retrieved Mary 25, 2014. ^ "Jason Mraz Tapped for Milestone Concert in Myanmar," Rolling Stone, November 16, 2012. ^ "70,000 Fans Attend MTV EXIT Live in Myanmar Featuring Jason Mraz". Archived from the original on July 4, 2013. ^ Jason Mraz, "Global Warming Is No Longer a Future Problem, It’s a Now Event," Huffington Post, April 28, 2012. Wikimedia Commons has media related to Jason Mraz. Playlist: Jason Mraz – Nightline 07/17/09 – Reggae to rock, Mraz reveals his musical influences.